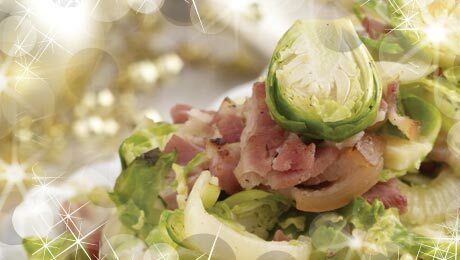 For me Brussels Sprouts are a traditional part of our Christmas Dinner, if you would like some crunch in your sprouts sprinkle with some chopped walnuts before serving. Rinse the sprouts under cold water and remove the outer leaves. Slice thinly and set aside in a bowl. In the meantime, sauté the onion in some butter and oil and add the streaky bacon. Cook for 4-5 minutes until the bacon begins to crisp. Add the shredded sprouts and toss with the onion and bacon, cook for a further 4 minutes. Squeeze the juice of one orange over the pan and toss the sprouts. Cook for a further 2-3 minutes until the liquid is absorbed. Remove from the heat and season with some salt and pepper.